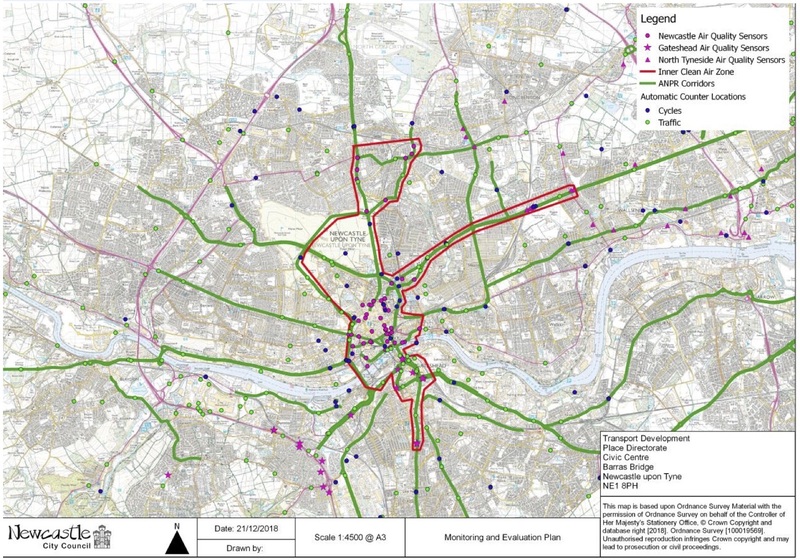 Newcastle City Council has published its feasibility study for a Charging Clean Air Zone. This shows that, other than in a few locations, air quality can be improved to be within legal limits by 2021, sixteen years after they should first have been met. Although this is welcome progress, it does mean Newcastle has missed the deadline set by Government to produce a final plan by the end of December 2018. What that final plan will be we don’t yet know, but we do know that by law it must include, or be as least as effective as, the Charging Clean Air Zones modelled in the Feasibility Study. If it does not it will not meet the legal requirement to meet air quality limits within the shortest possible timescales. It must also, as determined by the UK Supreme Court, prioritise areas where human exposure to poor air quality is greatest, and ensure that compliance with legal limits is likely, rather than just being possible. 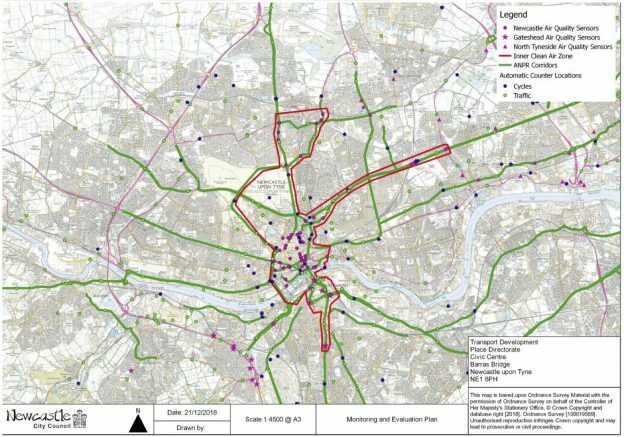 Newcastle, like other UK cities with air pollution issues, has had air quality plans that relied on measures like redesigning junctions to increase vehicle capacity and publicity campaigns to encourage people to walk, cycle or use public transport. As data for Gosforth High Street demonstrates, increasing vehicle capacity has meant increased traffic and more pollution, and encouragement is also unlikely to be effective while safety concerns are unaddressed and the city offers financial benefits in the form of cheap or free parking. The graph below projects the trend from improvements over the last ten years to show that if current trends continue, the city is unlikely to meet NO2 air quality limits until at least 2028. In this graph, the red line shows the highest reading by year from 2008 to 2017. In 2017 this was for Gosforth High Street. The black line is a linear trend line, not reaching 40μg/m3 (the legal limit) until the start of 2028. This itself is not guaranteed though and it could take even longer if no further action is taken. The more important line is the blue dashed line, which shows the profile if the Council’s plan is to achieve compliance by 2021. The green line shows the current legal limit that should have been met by 2005. Actual pollution measurements should have been beneath this line during the whole period shown. If the Council is going to clean up the city’s air pollution problem then it needs to get started ASAP. Newcastle and twenty eight other local authorities have been directed by the Government to produce a final plan, and Newcastle City Council isn’t the only one of those councils to have missed the deadline. Dr Thérèse Coffey MP Parliamentary Under Secretary of State for the Environment has recently written to Bristol City Council stating that Bristol had “unlawfully failed to comply with the [Ministerial] Direction” to provide a final plan by 31 December 2018 and that “any delay or non-compliance with [new] deadlines will result in my being forced to consider legal action against Bristol City Council which may include issuing proceedings without further notice.” The new deadlines for Bristol are 21 February for a final plan with consultation to start by 29 March. BBC News has also now reported that the UK is home to more children suffering from respiratory conditions than anywhere else in Europe. This video is Lily’s story. Lily and her family live in Bristol where the Council has yet to produce its plan. There are a number of relatively straightforward actions that the Council can start now, in advance of setting up a Clean Air Zone, that will help it clean up air pollution in Gosforth and Newcastle more quickly. Replace the four narrow 2.5m width lanes outside Gosforth Shopping Centre with two slightly wider lanes in the centre of the road so that the whole of the High Street is a single lane in each direction. This will move vehicles away from the pavement and reduce exposure to pollution for people walking, shopping and working on the High Street. This won’t make much difference to vehicle throughput as the High Street is already constrained by junctions and single-lane sections, but it will create space to trial a protected all age/ability cycle lane to give people an option to travel in a less polluting way. Good quality protected cycle lanes have also been shown to be very good for local businesses. Implement proposals that have already been through consultation covering pedestrian priority crossings for side streets and 20mph. This will limit acceleration / deceleration and reduce pollution and will also help make the High Street safer and more accessible for shoppers. Ensure pedestrian crossings are responsive for people walking who wish to cross the High Street, so people don’t have to wait at the roadside breathing in fumes. Improve enforcement of illegal parking and anti-idling laws. Create Metro-like branding of the GNR bus route from Haymarket to Brunton Lane, to make it easier to use a bus for irregular users. Review parking costs so that it is cheaper to park at the edge of the city and get a bus or Metro than to drive into and park within the city. Remove subsidises for parking in the city centre (e.g. Alive after 5) and use the money to support public transport or walking and cycling. Continue to increase awareness of local air pollution, for example via electronic Variable Message Signs or via posters on litter bins in polluted areas. Trial arrangements to reduce through traffic on residential streets as a quick way of enabling cycling for all ages / abilities as an alternative to driving, while also improving the quality of life for residents. This will also prevent polluting vehicles from using those residential streets to avoid any future Clean Air Zone. Also trial protected cycle lanes on Gosforth’s other main roads to connect with existing routes such as on the Town Moor and Great North Road. Trial “School Streets” where streets immediately outside local schools are temporarily closed to traffic during drop off and pick up to reduce children’s exposure to pollution and improve safety. Complete other local schemes that enable additional walking and cycling which have already been through consultation including Blue House roundabout and Jesmond Dene Road, city centre north proposals and Streets for People. How might we travel instead? 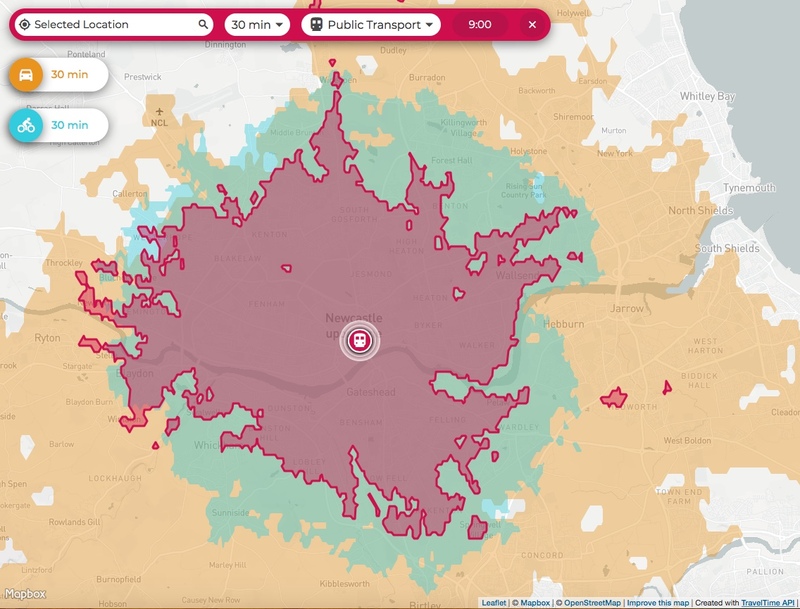 The following maps have been generated from TimeTravel Maps, a website that shows how far it is possible to travel by different modes of transport in a given amount of time. The first of these maps shows where you could travel from to arrive at Monument within 15 minutes. The red area is public transport – showing a spur going north up the Great North Road. Blue/green is the area for cycling and orange for driving. It is clear that over short distances there isn’t much time advantage to using a car, and any advantage there is may well be wiped out by time taken to park and walk to your final destination. This only takes into account time however, so in itself is unlikely to persuade anyone to change how they travel. For that, other issues such as the cost of public transport vs driving, and the lack of safe, direct cycle routes will also need to be addressed. The second map shows where you can travel from to arrive at Monument within 30 minutes. Practically all journeys travelling from within Newcastle to the city centre can be made in 30 minutes by all three modes of transport. Newcastle City Council, along with Gateshead and North Tyneside Councils, modelled three variations of Charging Clean Air Zones, as well as a do nothing option. All three variations (B, C and D) included a charge for buses, coaches, taxis and HGVs. Variant C also included a charge for vans/LGVs, and Variant D included vans/LGVs and private cars. The charge would only apply to vehicles that do not meet the required emissions standard. For cars this would be EURO6 for diesel and EURO4 for petrol vehicles. The zone used for the CAZ is the map at the top of this blog covering Newcastle and Gateshead city centres, the coast road, Spital Tongues and Gosforth between the High Street and Haddricks Mill Road. The modelling results show that the most effective CAZ was D, including charges for private vehicles. Even in that scenario the Central Motorway East and roads approaching the Central Station would still remain above the limit in 2021. Further details can be found in the Strategic Outline Business Case section 1.8. Couldn’t agree more about the need for proper integrated public transport, Stewart. Unfortunately the deregulation of buses in 1986 made this very difficult in the UK. Tyne and Wear also failed in their bid to try this through Quality Contracts a couple of years ago. Every bus that travels down Gosforth H igh Street stops there, however. And the figures shown at a recent council meeting suggested that around 20-25% of the pollution on the High Street is caused by buses. The vast majority is caused by the 18,000 or so private vehicles that travel along there every day. Perhaps more folk on those buses would help! The macro and micro siting criteria listed in Annex III of the AQD should be considered carefully when defining the subset of receptors for compliance assessment. The receptors should be at least 25m from major junctions and be representative of at least 100m road length. Please note that these siting criteria are different to those specified in TG16, which are typically at the highest pollution hotspot. Receptors within the carriageway of the road will be excluded from the subset except where there is normally pedestrian access to the central reservation. (From the evidence package in https://www.whatdotheyknow.com/request/air_quality_guidance_given_on_no_2). Thanks Andrew, useful to see the guidance the Council will be working to. The diffusion tubes we have reported on are the official ones used in the Council reporting. For the one at the top of the High Street this is about 40m from the Salters Road junction and in a location likely to be representative of air quality along that stretch of the road from Ivy Road to Woodbine Avenue, which is further than 100m. The annual air quality status reports are here in case you haven’t already seen them. I haven’t spotted anything that says to only consider a subset but it’s possible I might have missed it? How could we get one. Agreed we need more vegetation along the whole High Street. It won’t make much difference to pollution levels though. Also, if you’re on the High Street pavement, the exhaust has to go past you before it hits the vegetation. We need to fix the problem rather than the symptoms. Reduce the through traffic. It’s not the A1 any more! On all the above, firstly I reckon the current NCC AQ station is approx. 16.5m away from a centre point of the Salters Rd junction, approx. 11.5m away from waiting GNR northbound traffic and only 4m from the roadside kerb. Would it not be fair to say therefore that measurements taken here are representative of the junction as opposed to a singular 100m stretch of road? In relation to Moss Trees (approx.cost £25,000 each) and walls, installation and maintenance costs would be a big factor. What might have been better was to plant a hedgerow on either side of the entire length of the GNR in the space created by reducing lane numbers/width. Finally on the Clean Air Zone and charging, I think we will end up with a City Centre charging zone based around Percy St, Clayton St/West, Neville St and Pilgrim St/John Dobson St, with relatively low charges for crossing Tyne, Redheugh and Swing Bridge. Comments and views from the consultation however will be very interesting, particularly if there is a ‘support’ or ‘not support’ question. Hi Paul, there is an automatic monitoring station by the Salters Road junction but the official Council monitor giving the higher readings is outside the shops south of Woodbine Road. Apologies. Spotted it, attached I believe to a lamp post on the corner of the Jan Forster shop approx. 50m away from the centrepoint of the new junction. Out of interest what is the main reason/s which caused the jump from a NO2 annual mean of 20.2 in 2015 to 59.3 in 2017? It doesn’t say in the report but in 2016 the monitor location was moved from the junction to where it is now. The old monitor was a bit further away from the traffic as well as being in a more open area. Hopefully this link will work to show where I think that was. What is the feedback about cyclists using the cycle route from Regent Centre going south into City avoiding Gosforth High St. ? The new lights on Church Rd cause more stationary traffic to build up as there is a rat run from cars blocked as far back as South Gosforth metro and they can cut round and then block up Church Rd so no one else can move. More pollution and frustration.